International Traveller’s managing director, Quentin Long, crunched some numbers and found that for the right people, some layby holiday providers can make great financial sense, while others can cost you 85% more! International Traveller’s managing director, Quentin Long, crunched some numbers and found that for the right people, some layby holiday providers can make great financial sense, while others can cost you 66% more! Here he reveals his do’s and don’ts of layby travel. Following a Mamamia article about layby holidays, sponsored by a company called LayAway Travel, I recently received many enquiries about this form of booking whereby a client places a deposit on a holiday and fixes the eventual full price. Personally, I am not a fan of layby holidays for a simple business reason; they only make sense for the small percentage of us who are financially disciplined. Some layby holiday programs can become predatory when travellers pay an inflated cost for the holiday or it becomes a financial burden when the traveller does not meet the payment plan. It’s also worth noting that many holidays booked through a travel agent are in fact de facto laybys. There are a number of operators that offer travellers layby packages, either online or as a service offered by a travel agent. My advice is to not use an online-only operator. I reviewed several and they were mostly so poor in the range of holiday offerings I didn’t investigate further; it is not something I would feel comfortable using for my holidays. There was one exception, LayAway Travel. Travellers can choose a much broader range of hotels and resorts and therefore it is much easier to find the right holiday. I was impressed. So I took the next steps and compared a Fijian holiday for a family of four booked through LayAway Travel versus Do-It-Yourself (DIY) booking. Randomly, I chose the last week of January, purposefully avoiding high peak season like Christmas, since that’s never a fair comparison with sky high prices and no availability to 3rd-party operators. By my calculations LayAway Travel would be 66% more expensive for this particular Fijian holiday. This is not necessarily a direct comparison as there are different things to consider – you would need to pay for the airfares up front for the holidays I investigated, and maybe their cancellation policies would be different. But the actual dollar numbers are real – through Layaway the total cost of the holiday would be $6055, while booking yourself (and paying for airline tickets upfront) the same holiday would have cost $3639.40. That’s an additional $2415.88 or 66.4%. *Of course, prices change rapidly and fluctuate, but below are my findings at the time of writing. Like many deals that seem too good to be true, it’s often because it is. Before locking into a layby program, be sure to read the fine print so you’re aware of the ramifications if you can’t make payments in time. Be realistic about your own financial capabilities and any penalties you may incur. A good example is Escape Travel – the retail travel agent group who have the most customers using a financial service to pay for their holidays. The service is fantastic for the right people, but potentially expensive for some. It’s not technically a layby, but an interest-free finance option via a third party credit card with a 12-month interest-free period. You put the transaction (in this case the holiday) on the credit card and then have 12 months to pay it off before you get charged interest. There is some fine print worth noting though – the holiday must be more than $999, there is a $99 annual fee for the card and you need to pass all the usual credit checks. The danger is obvious. Those that are not great at managing their money arrive at the 12-month mark not having paid it all off and are now paying 22% p.a. for their entire holiday (yes, the whole amount not just the balance). But for the financially disciplined it is a fantastic way to pay for a holiday; it is always better to have money earning you returns in your accounts than cash in someone else’s hands earning them returns. My sources say that Escape’s layby service is particularly popular with baby boomers who can keep their superfund money earning interest for an extra 12 months, while still enjoying a holiday. 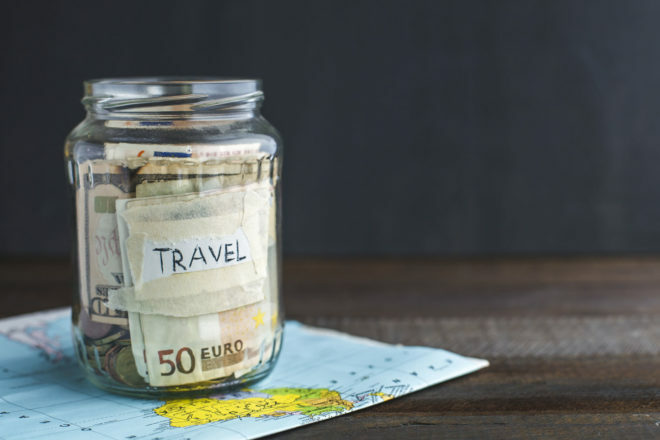 Another popular program that’s great for those who are good at managing their money is STA Travel, offering a layby service on products like Contiki tours and packaged holidays. The deposits range from $99 to $250 with the same eight weeks prior to departure deadline for full payment. There are no other financial services and institutions involved. Most travel agent bookings will require you to pay a deposit and then meet a deadline – typically you have two months prior to departure to pay the balance by. That sounds a lot like a layby, right? Say you book the holiday eight months before you travel, you then have six months to pull the money together to pay for it. The same is for most cruises. To make it work I suggest you set up a direct payment every month to make sure you have paid your holiday booking off in full before the deadline. Just remember to turn it off when you have made the final payment, we don’t want to pay more than we have to. A side note, many ‘special deals’ have terms and conditions that require payment upfront or within seven days so it doesn’t apply to all travel. If you book through a travel agent, make sure it is an ATAS (AFTA Travel Accreditation Scheme) accredited agent, which has been tested and approved by this third party industry body. This stamp serves as an indicator of quality and professionalism, and should anything go wrong with your holiday layby, you have the added safety of having a national board with strict guidelines. Most website booking engines, particularly for accommodation, now have a ‘book now pay later’ option at checkout, which does mean you hold onto your cash a little longer. As mentioned before, the longer you have cash in your accounts working for you, the better. Sometimes things don’t go to plan. There is always a danger that the layby company will go under before you have had your holiday and your money goes with it, particularly if the online provider is not based in Australia. Always make sure you use a credit card to purchase travel as it will protect you – the card supplier will refund the money should the company go down. In terms of protecting yourself, travel insurance is another must in case you need to change or cancel your booking – both will attract charges. In the worst case scenario you could lose all your money if you are late in changing plans. As always, look at all the Product Disclosure Statements of any financial contract you enter, read the fine print, consult a financial planner and make decisions on spend that fit your budget today, not what you hope it will be tomorrow. While layby travel isn’t for everyone, it’s a potential way for those who can’t foot the bill straight up to still enjoy the holiday they’ve always dreamed of. The important learning from this article is that it’s imperative you do your own research. Make sure you factor in the total costs, and if the layby bill winds up slightly higher than it would to pay up front, weigh up whether the final cost of the convenience of staggered payments is more important to you.